Like you need more free outdoor movies events on your calendar? 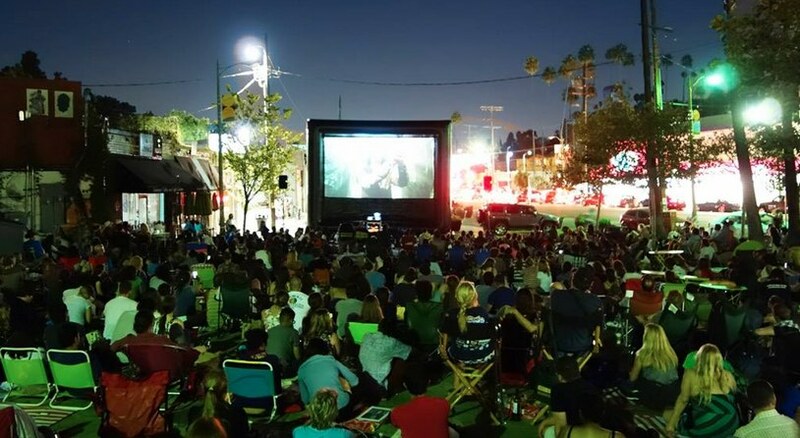 Back for its fourth consecutive year, The Silver Lake Picture Show is a free, summer-long community event that screens popular films in a picnic-like setting at Sunset Triangle Plaza, which is specially closed off to automobiles during the event. The Silver Lake Picture Show feature presentation is prefaced with performances by live bands and additional screenings of short films produced by local filmmakers. Screenings routinely attract around 500 guests and the series claims to have had over 10,000 attendees in total since its inception. No RVSP is required but seating is highly limited, however, so early arrival is encouraged to claim a spot. For more answers to questions on attending I encourage you to visit the event FAQ page. The series will run every other Thursday evening starting on June 25 with showing of Pee Wee’s Big Adventure and concludes on September 17 with Fear and Loathing in Las Vegas. Full schedule of shows after the jump. Sunset Triangle Plaza is located at 1523 Griffith Park Blvd, Los Angeles, CA 90026.